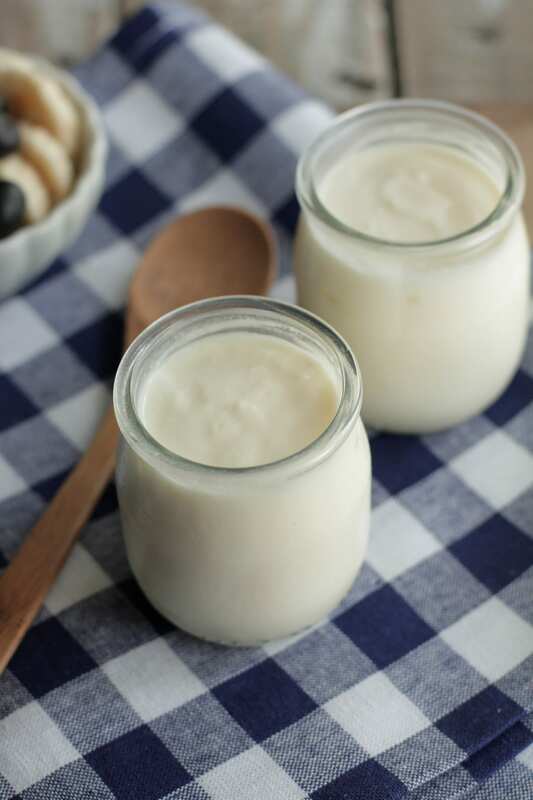 In fact, once you see how easy this homemade yogurt is to make, you will wonder why you haven’t made it yourself. I am all about easy and tasty! When the two combine, BAM, I love the results! Before I share the steps to make homemade yogurt, I think I should settle something first. While I do make yogurt, I regularly buy it.. Gasp! I know. Sometimes life pulls in too many directions and I just don’t have the time to spend an extra 15 minutes in the kitchen. I found a brand that is hard to find at big conventional grocery stores, but many health food stores carry it. I would love to share the brand, which reminds me most of homemade yogurt, however, I am concerned my readers may wipe me out. Okay, okay, I will share. But, you must promise to leave some if you go out and buy this yogurt. While most weeks I buy (in bulk through my food co-op) a case of Seven Stars Plain Whole Milk Yogurt, there are times it simply isn’t available or cost-wise I need to cut down on my food spending. Perfect time to make my own. A few years ago, as our family decided to start eating real food and started reading food labels in the store, I realized the yogurt in the grocery store just wasn’t going to cut it! Talk about scary ingredients. I switched over to Stoneyfield Whole Milk Yogurt, but the cost for our family was just too much for the amount we consumed each week. I tried many homemade recipes online but none really turned out well. One day I found a crock pot recipe featured on Keeper of the Home. I eagerly tried it out and guess what? I tweaked a few components of the recipe and soon found I could make great, real yogurt full of nutrients with just a few minutes of prep time and some planning. If you are going to make this yogurt you will need to plan ahead. While this yogurt only requires 15-20 minutes of active kitchen time, it does need to sit for around 8-12 hours in a crockpot to allow it to culture and turn into creamy yogurt. I have found it works best to do all the prep work before I go off to bed and leave it out all night while I sleep. When I wake up, I have yogurt. Viola. In fact, once you see how easy this homemade yogurt is to make, you will wonder why you haven’t made it yourself. I am all about easy and tasty! 1/2 gallon whole milk I have a difficult time getting my raw milk to always set properly. Please avoid using ultra-pasteurized milk. Turn your crockpot on high. Be sure to do this first, as your crock pot needs to warm up properly before you place the milk inside. Now is also the time to take out your yogurt starter and let it sit on the counter, to warm up a bit. Pour all the milk into the pan (I use this) stirring occasionally until it begins to bubble and get frothy (around 185° if you would like to use a kitchen thermometer). Watch your milk to be sure it doesn’t bubble over or burn the bottom of the pan. While you are keeping a close eye on your milk, now is the time to get a cold ice bath ready for your pan. Fill your sink with some water and ice. Now that your milk has started to bubble, turn off the burner and transfer your pan to the sink full of cold water. Place the pan in the cold water, but don’t allow any of the water to enter the pan and touch the milk. Keep the lid on the pan. Allow, the milk to sit around 10 minutes. You want your milk to cooler, but not cold. You need to have warm milk for the crock pot. While the milk is cooling, scoop out a 1/2 cup of yogurt starter. Once the milk has cooled (but is still warm…10 minutes) turn off your crockpot (which is now nice and toasty warm). Place your yogurt starter and 1 cup of warm milk in the crock pot and gently whisk together. Now, add the rest of the of the warm milk to the crockpot and stir. Note to self: The baby will try to eat all your yogurt starter. Next time, make yogurt after bedtime. With the milk and yogurt starter in the crockpot (now turned off), place the lid on. Now wrap up your crockpot with a couple large towels. Tuck your milk and yogurt into bed, all nestled in to keep nice and warm. Let that bacteria get to work making fabulous, creamy yogurt! Leave your crockpot alone for 8-12 hours. The longer you let it sit, the tangier your yogurt will taste. I like the taste at 10 hours. I know you may be tempted to take a peak and spy on what’s happening under those towels, but don’t! Your milk and starter need time to culture. After 8-12 hours, remove the towels from the crock pot and you will find–yogurt! Before you stir or shake the yogurt, place your crock pot in the fridge and allow the yogurt to set. I usually allow it to set a couple hours. I’ve even neglected it all day in the fridge. After your yogurt has spent some time setting in the fridge you can now scoop into the containers of your choice. 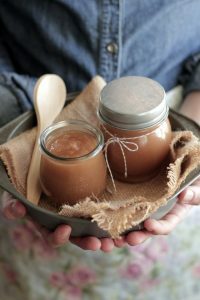 I use quart mason jars (like these). We like to drizzle raw honey in our yogurt. We also berries or homemade jam to sweeten it up. I occasionally semi-defrost strawberries and blend with a little honey in the food processor and mix into the yogurt for a fruity twist. 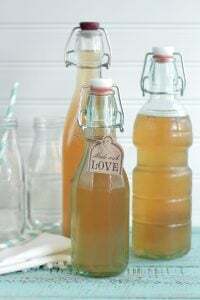 Pure vanilla extract (learn how to make your own) and raw honey can be combined for a french vanilla twist. My family eats tons of yogurt–we could really save a lot of money by making our own! I’m stopping by from Frugal Crafty Home Blog Hop–thanks for linking up! Thanks for stopping by Carrie! We eat a TON of yogurt too! It really has proven to be very cost effective for us even with buying the best milk I can find! About two quarts of yogurt, Jennie! Thanks! Will give it a try! What temperature do you aim for with the yogurt milk when you turn the crockpot off and put towels on? I had a hard time maintaining the temperature warm enough when I used a Dutch oven and wrapped towels around it and put it in my oven and put a light on. I’m hoping this might work better. That recipe I was too cool the milk to about 112 to 116°. do you recommend a particular temperature ? Kristin…you are a awesome super woman…to flippin cool!! I want to try and make this! I can’t wait to here how it goes! It really is so simple! You will love making it! Thank you! I look forward to checking it out! It really is so easy and yummy! I’m so glad you shared this. I’ve seen recipes that have called for a lot more involvement that seemed a little overwhelming to me! This I could do! I can’t wait to try this! I love yogurt and I am hopeful one day Elizabeth will be able to eat it. We did a dairy challenge two weeks ago and it was not good. It really is so easy and creamy! Hope she will be able to join someday too! Many times people with dairy issues do great and find lots of healing from raw dairy. Raw butter and raw heavy cream are usually what is considered the easiest to digest at first for people with dairy intolerances. You might of done this already, but if I was you I would try A2A2 milk it is a different genetic of cow milk that we who can not eat regular cow milk can drink this. Exactly the same uses but much better! I was so excited to try this recipe. Unfortunately it never set. I didn’t use raw milk and my yogurt did have probiotics in it. Any ideas why? Did you allow it to set in the fridge after sitting on the counter for about 10 hours? Was the crockpot well wrapped with towels to keep it warm for those 10 hours? The fridge really helps set it. Also, ultra-pasteurized milk will cause it not to set. I have made yogurt this way and mine never turns out. It gets too cold. So what I do is cook the whole time in a crock pot. I keep the temp at 110 for several hours. It took me several fails to get this figured out. Awesome, Jennifer. Thank you for sharing! Yes, I followed the recipe. 10 hours on counter with towels and then 4 hours in fridge. I used batch pasteurized milk, grass fed. It seemed a little thicker after the fridge time, but still very, very liquid. It also didn’t have that tangy flavor of yogurt. Very faint but I could still taste the milk. Not sure what happened. I would recommend straining it in a cheesecloth if you want to use it as yogurt because of the consistency you describe or it sounds like it will be perfect for smoothies. Not sure why it’s not tangy. I haven’t had anyone have these issues nor have I. Great tips! Thank you for sharing, Bethany. I made your crockpot yogurt last week..2 quarts last week and it’s gone! I’m not sure that for the effort it saved much money but it was very satisfying to have succeeded in making it. I have a question about the consistency.. It’s probably a science question related to the probiotic nature of yogurt. There is a stringyness to it that is different from store bought yogurt. Any idea what that is? My yogurt has been sitting in the crock pot for 1.5 hours now! So excited! It was a great science experiment for my little man. Thanks! Looking at making some other recipes you have! Love your site! Its’ really an awesome project for kids to partake in! Love that you got him involved! I tried a different crock pot recipe a few weeks ago just to see how it went and it did not go well…I like your method best. I have found that it is important to follow the directions spot on; for those having trouble make sure you check your milk while it’s in the water bath to make sure it doesn’t get too cool, your milk will cool slower or faster depending on how much ice you use. My milk is in the mid to upper 90’s when I put it in the crock pot and it sets really well. Reheating the milk if it gets too cool has not yielded good results for me. I use plain Greek yogurt and let it set for 9 to 10 hours and it is pretty thick. I love how quick it is to make initially, I made some this morning and when we got back from our outings there was about 2 hours left until it was done! It is a very exciting thing to be making real food; my husband loves his yogurt and brags about it at work (and gets lots of oohs and ahhs)! A+ to you Kristin! thanks for sharing this! I have a couple of questions, what is the reason for boiling /simmering the milk beforehand? I would have thought bringing it to warm with the starter would be enough? also, does it make a difference if you put it into a different container before refrigeration? I don’t often have room in my fridge for the crock pot! thanks. Hi Kristin, Great questions. You want to heat the milk because the cultures from the starter need a nice warm environment to thrive and do their work. The warm crockpot and towels are not enough to do this, so we heat the milk just enough to get it warm. I have had the issue of the crockpot not fitting in my fridge. Unfortunately I find it never sets well when I scoop it in containers and then refrigerate. The refrigeration of the crockpot (without disturbing the yogurt) is critical to getting a set yogurt. Hey! Guys make yogurt too! You can skip the ice bath step if you want, and just put in a thermometer and wait until the milk gets to about 115 before adding the yogurt and pouring into the crockpot. You can make keifer with the same steps. That’s a great way to make it as well. Thanks for sharing. Looks delicious! I am planning to make this tomorrow and wondering if you ever attempted making greek yogurt with this recipe? Would you just have to strain it at the end? I don’t know if this was already addressed in the comments section, but for those who have an issue with the yogurt not setting properly, it is very important to use fresh yogurt for your starter in your initial batch. The cultures in store bought yogurt die off rather quickly! I hope this helps. The raw milk dairy I frequent makes yogurt. In order to retain the medicinal benefits of raw, they never heat their milk beyond 101 degrees. Their yogurt has just the right amount of twang and all the benefits of raw milk. Delish! Even our dog likes – no LOVES a little plain yogurt mixed in her dog food! Looks like I will be making it even more often. Don`t know what I did wrong but this did not take for me. Hi Jacqueline, Sorry to hear your yogurt didn’t come out. There are so many variables and since I wasn’t there, I’m not sure what might have happened. The good news is you can still use it for smoothies as a milk kefir (just a drinkable yogurt like they sell in the store) and it still has good probiotics. I’d love to help you trouble shoot, can you explain a bit more? You’re awesome! Thank you so much for sharing. I am definitely making my own yogurt, after just watching a video on “5 Signs You’ll Get Cancer”. I searched Pinterest for his book, “The Guide To Healthy Eating” and he mentions how organic yogurt is best and you can just add fresh fruit for taste. So, I searched Organic Yogurt and found you!! Thank you for breaking it down and even sharing the links of the items you use. You’re the best! I made homemade yogurt yesterday with raw milk. It was a different recipe, but similar. The result was a liquid consistency, just slightly thicker than the milk was when it started. I do not have a crock pot that is big enough, so I used a regular pot that I wrapped with a ton of blankets. After 9 hours, the water bath was barely warm. I am now scared to eat the “yogurt” – do you think if the water got too cool, could it make us sick? Just curious if you have an opinion. I hate to waste it, raw milk is expensive! Hi Shannon, sorry for the delayed response. If it’s runny it’s still okay to drink or use. It will be more like milk kefir. It should be tangy like yogurt when you taste it. Raw milk is really hard to set for yogurt making. One reason I go with a low temp. pasteurized milk when making yogurt and save our raw milk for drinking and baking. Kristin you are simply amazing! Your blog continues to inspire me to create nutritious and healthy food for my family! Are you using non homogenized milk? Have you ever put a couple vanilla beans in the milk? Hey Kate, Thank you! I’m in the U.S., so I use a U.S. gallon. I’m not sure how that converts to metric, hopefully you do :). I’m sure it will be completely gone before I need to know this, but after yogurt is transferred into containers, how long can it be stored? Would love to try this soon but need to get the utensils first! Question: how long does the yogurt keep in the fridge after it has been made? When would I need to use it by and how much yoghurt do you end up with? How many jars would I need? Hey Jessica, Yogurt tends to keep longer than milk due to the wonderful bacteria. I’d probably keep it in the fridge for two weeks. You could also freeze any extra yogurt. I usually end up with about 2 quarts of yogurt- so two quart size mason jars or about four pint sized jars. Enjoy!! I love those jars in the picture! Where do you get them? Thanks, Jean! They are actually glass yogurt containers. I can’t remember the brand, but I believe you can find them at Whole Foods and some health food stores. I make yogurt using raw milk all the time. The temp matters big time while making this. You should never add the yogurt starter at a temp higher than 110 degrees, the cultures can’t survive high temps. I do the entire process in the crock pot. I add the milk to the crock on low leave in until it reaches 110 then add the starter. I remove it from the base and let sit wrapped in a towel in the oven over night with just the light on. I also strain off the whey to make a thicker Greek style yogurt. Love this yogurt! Very good to know! Thanks for sharing, Jeni. Wow! Can’t wait to try this! I have two questions: I live at nearly 9,000 ft elevation, the ‘bubbling point’ of milk is obviously lower here, are there any adjustments that need to be made in the recipe for altitude? The second question is this: I ONLY have available here raw milk or ULTRA ULTRA pasteurized boxed (unrefrigerated) milk. Do you know of any adjustment I can make to use the raw milk for yogurt? Thanks for the wonderful recipes. Hey Katrina, I’m not really sure about altitude. I live in Florida at sea level, so I’ve never had the chance to experiment with higher altitude cooking. I might try googling “making homemade yogurt at high altitude”. I would suggest not using the ultra-pasteurized milk. The milk is basically dead and won’t culture or even set. I personally don’t have a ton of success with raw milk, but I know bloggers that love using raw (successfully). Jenny at Nourished Kitchen talks about using raw milk here: http://nourishedkitchen.com/raw-milk-yogurt/. Much success! Love his recipe—super user friendly! Thanks!!! I have made it a couple of times and planning on another batch this week. I have noticed mine runnier than store bought yogurt—but it looks like I should just strain it in a cheese cloth a little bit? What is the best way to do that? A scoop at a time? Thanks! Thank you, Robyn. The yogurt will be a bit runnier than store-bought yogurt. You can strain it through a cheesecloth. Slowly pour (scoop) the yogurt in a cheesecloth (with a bowl underneath). Hang the cheesecloth over the bowl for about an hour. The liquid in the bowl (whey) can be added to smoothies or used for soaking grains or fermenting. The yogurt in the cheesecloth can be scooped into a container and enjoyed. Thanks so much! I appreciate the advice! Making it again this morning! You’re welcome, Robyn! Let me know how it goes. Ok…..so I LOVE this recipe and have made it a ton. Thank you! HOWEVER, I made it yesterday and totally forgot about it and left it in the crockpot an extra 10 hours before moving it to the fridge!!!! Does it need to be trashed or can it still be used (without anyone getting sick)? I didn’t try it..I’m sure it’s super tangy though. Hey Robyn, I’m so glad you love this recipe!! 🙂 I think your yogurt will be just fine (thanks to all the wonderful culturing that happened in the crock-pot), but it’s probably super tangy! Well as long as you don’t think we will get sick I’ll probably at least use it in smoothies if it’s too tangy to eat straight. 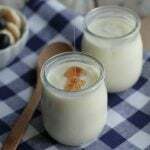 I have been reading about homemade yogurt now I think I’m ready to try, question – would grocery store brand organic milk work (in gallon jug)? I’m not sure how pasteurized it is. As long as the milk isn’t ultra-pasteurized it should work. The jug will usually read “ultra-pasteurized…” if the milk is ultra-pasteurized. Regular pasteurized milk will work great for this recipe. I can’t wait to hear about your yogurt-making! I make this with a gallon of milk and it makes about 8 cups which I eat all by myself each week yum!!! I use a crock pot liner so I don’t have to clean the crock and it transfers easily to strain for thicker “greek” yogurt. After it sits for 8hrs I put mine in a cloth lined strainer that’s set in a 13×9 baking dish that’s on a cookie sheet to drain the whey out for 8-10hrs and it becomes super thick which I love!!! I have it on the extra pans because the whey drips from the cloth that overhangs and it gets messy on the counter. You can drain less for less thick but I love it that way. It also works good to put on stuff like you would sour cream. Awesome, Lisa! Thanks for sharing! Mine was a bit runny and lumpy but I just discovered that i used homogenized milk. Is that why there were lumps. It tastes awesome though and I’ll definitely try it again. After reading the comments I’ll also try straining it. Hey Belinda, I’m so glad it tastes great! There’s nothing like the taste of homemade yogurt. Sometimes letting the yogurt set for a bit longer in the fridge can help create a thicker yogurt. Homemade yogurt will always be a bit runnier than store-bought due to the lack of thickeners, but shouldn’t be liquid either. Hey Amanda, Yogurt is cultured, so it will last a few weeks in the fridge. Do you think this could be done with goat milk? Hey Samantha, I think goats milk will work very well! The end result was liquid thick milk with a hit of yogurt- ha! I did notice that the milk didn’t quite make boil to 180, not sure if my crackpot is going. I kept testing it with the Thermometer and it didn’t work. So I made it to about 170. Is that the culprit? Would love your feedback as I am giving it another shot. The milk should come to a slight boil in the soup pot or sauce pan (while the crockpot heats on the side). The crockpot doesn’t do any actual cooking. The reason for heating of the crockpot is to create a very warm environment for the cultures in the yogurt starter to thrive and grow…creating yogurt. The milk in the saucepan or soup pot can take a bit of time to reach that slight boil…around 10 minutes, as it’s done slowly to not burn the milk on the bottom of the pan. Once the milk is heated in the soup pot or sauce pan, place it in the water and allow to cool, just long enough so when you add the yogurt starter to the milk it’s not scorching hot and kills the cultures. Then add the milk and yogurt starter to the crockpot and turn off as the heat has done the job of creating a warm environment. Place the top on the crockpot and wrap in towels to keep that nice warm environment. Then, follow with the fridge later. Hope that helps clear things up :). Let me know if you have questions. I tried this for the first time last night and it turned out amazing!!! We go through two of those big tubs of plain yogurt a week for morning smoothies and this recipe will really help cut the cost…. it’s honestly the best plain yogurt I’ve ever eaten…. love it! A big thanks for the recipe! I also used a crock pot liner which made clean up a breeze and easy to transfer to a container in the fridge…. loving it! That’s awesome, Brandi! I’m so glad you love it. And what a great idea to use a crock-pot liner!! That’s wonderful, Andrea!! I’m so glad the tutorial was helpful and the yogurt turned out amazing! Is it okay to use a vanilla flavored yogurt as my starter instead of plain? Hey Brandee, I’ve never tried it. As long as the back of the container reads: “live active cultures,” I think the vanilla will work. Congrats, Brandee! I’m so glad your homemade yogurt was a success. That’s very interesting about the vanilla versus plain. 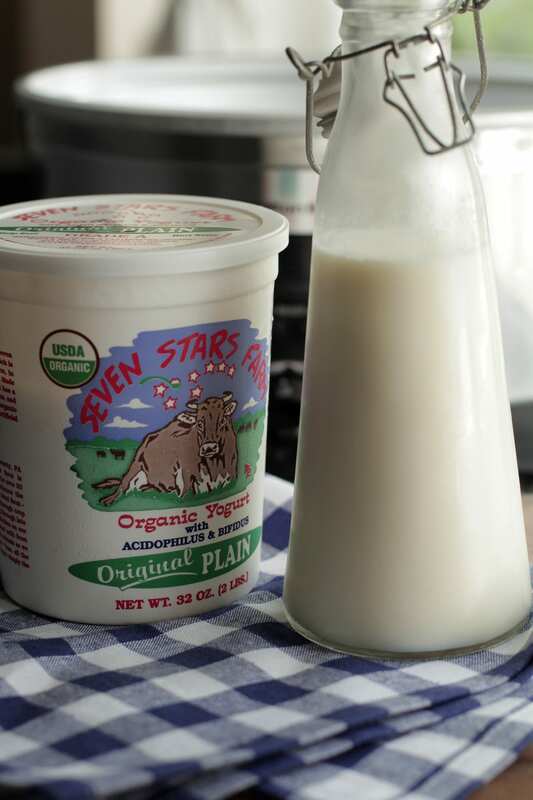 It will be fun to see how your next batch of yogurt turns out using the plain yogurt. I think the recipe should double just fine…let me know how it goes! Morning Kristin, and everyone else who may have input…I was so emitted to try and not patient enough to wait till I bought plain yogurt for a starter so I used 1/2 cup of kefir (a store-bought drink, not actual grains or anything). It worked, I think…but I’ve not done it w yogurt so can’t compare. It’s pretty tangy and a little tiny when I mix in homemade honey sweetened preserves…had anyone else tried it with kefir? Just wondering if I still should try it with yogurt starter. Hey Tami, I haven’t tried using my kefir for making yogurt. Cultures of Health explains the differences between yogurt and Kefir starters well: http://www.culturesforhealth.com/difference-between-yogurt-kefir. The tanginess probably comes from the kefir, as kefir is incredibly tangy versus regular yogurt. For this batch, I’d reserve 1/2 cup for a starter and see how it goes next time or just use a yogurt starter. Goodness…my coffee still has not kicked in…I missed the autocorrect in that msg…that should say impatient not emitted and a little runny not little tiny!! Thanks for the link. Great info. I think I’ll try another batch tomorrow using the yogurt as the starter like you suggested! What I made was great in a smoothie. Thanks again! What would you think about almond milk? We don’t generally use cow milk but LOVE yogurt. Hey Tahsha, I’m not sure about almond milk, but coconut milk will work. 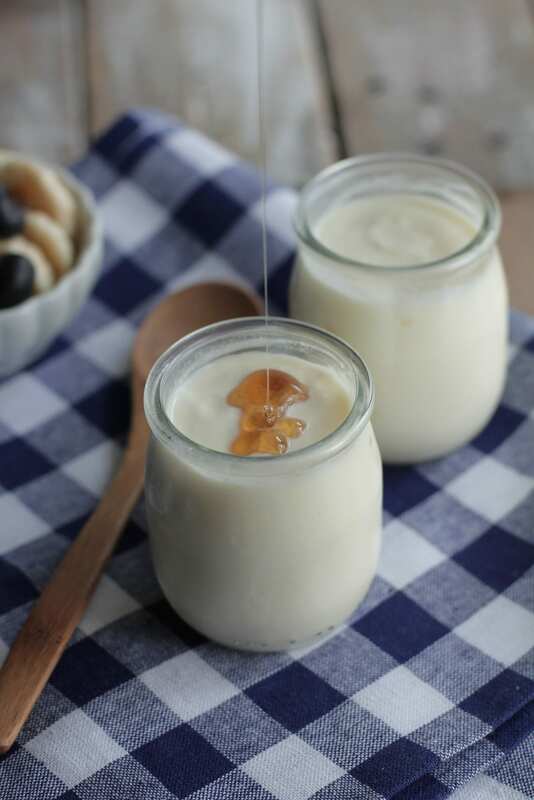 Here’s a great coconut milk yogurt recipe: http://www.thespunkycoconut.com/2010/10/dairy-free-yogurt-2-soy-free-refined-sugar-free/. my yogurt is chunky and didn’t set well. It’s thick, but still liquidy. I stirred it after pulling it out the fridge and it tastes okay, except for the little chunks. Feeling very defeated over here. Oh no, Danielle. I’m not sure what might have caused the little chunks…possibly something during the culturing stage. Are they similar to cottage cheese chunks? I would try whisking the yogurt to see if the chunks easily dissolve. Thanks for the recipe! I am always looking for new ways to make yogurt. Just one tip that I found very helpful when making yogurt and I know that it requires a bit more time. When your yogurt gets to temperature, 180, the longer you keep it at that temperature the firmer it will get. Not by a whole bunch but enough to make a difference. I stir mine at that temp as close to 30 minutes as I can. just a little tip that not a lot of people know. Thank you, Becky! That’s a great tip!! That’s great, Aroha! Thank you for sharing your method…I’m going to give it a try next week. Hello. This question is to Aroha or Kristin. You say that you added powdered milk and honey I’m just curious to know the measurements of those for the half gallon of milk? Did this last night exactly like you said and it turned out AWESOME! I was kind of worried that it wouldn’t turn out since there were a few people on here that said they had troubles, but when I pulled the towels off my crock pot this morning it already looked thick like yogurt before I put it in the fridge so I was a happy camper. I used a fresh tub of Stoneyfield whole milk yogurt for my starter. My one year old loved it and she’s the ultimate taste tester, so when I say that, you know it’s good 😉 Thank you!! Will be making this regularly. Once again, thank you for being a source of healthy change in my life! About how long does this yogurt last do you think? Hey Maurianna, Due to the cultures yogurt will last longer than a standard bottle of milk. I’d recommend eating the yogurt within a month of making it. Hi! If I were to freeze the yogurt, would that kill the good bacterias? Thank you! This sounds amazing! I’ve been wanting to make my own yogurt for quite some time. I do have a couple of questions though. First off, my crock pot has warm, low, and high options. Is using the high-turn off-towel wrapped options essential or can I just place the crock pot on low or warm? Secondly, have you tried placing the ingredients in jars prior to placing them into the crock pot? I wonder if this will change the chemistry, but I also feel like this will come in dandy as far as cleaning and single servings goes. Hey Lena, Awesome! I think you’ll really enjoy the experience and yogurt! I would go with the high option, then turn it off, and wrap the towel around the yogurt. The crock-pot won’t heat up for very long, so the high setting should create a nice, warm environment for the yogurt. I haven’t tried placing the jars in the crock-pot, but I’ve read blogposts recommending this method. I would probably add a bit of water to the bottom of the crock-pot and the jars during the heating process. Then add the yogurt to the warm water/jars/crock-pot. I’ve never tried this method, but just thinking through it at the moment, that’s what I would attempt. It worked wonderfully! Thanks for the recipe Kristin. Awesome, Jessica! I’m so glad you’re enjoying the yogurt! Thank you so much for sharing this recipe! My children are allergic to dairy and I limit their sugar, their normal yoghurt is over $2 a container and with 3 little ones that adds up fast by the end of the month. Using their lactose free whole milk I made this recipe, followed it exactly and it turned out amazing! They devoured it! My hubby is delighted as it only cost $3 for the whole crockpot full of yoghurt. This is a huge blessing- being a stay at home mom every cent counts to allow me to stay at home. I have been wanting to try making yogurt for a long time… do you just strain the yogurt (cheese cloth?) to achieve greek yogurt? Also, where did you get those adorable jars in all your photos!? Hey Heather, Yep, you’ll just want to hang the yogurt in a cheesecloth for several hours over a bowl. The result will be a nice Greek-style yogurt in the cheesecloth. The leftover liquid in the bowl (whey) can be used in smoothies or tossed. 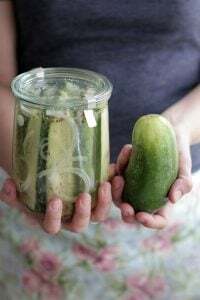 The jars in these photos are called Weck: http://amzn.to/24UYTTO. I absolutely love them! I make this yogurt all the time and absolutely love it! It’s so simple! ???? I am going to go dairy free for a month to see if it helps balance my hormones but I really love yogurt. Haha. I followed your link for the coconut yogurt in the comments which led me to her cashew milk yogurt and the directions are so similar to yours that I’m thinking it’s worth a try to use cashew milk and maybe a store bought almond milk yogurt with active cultures as starter and your crockpot method? I’ll let you know how it goes! Thanks again for all that you do! Hey Brandi, I’m so glad you love this recipe :). I would love to know how the dairy-free yogurt turns out! First of all, I was terrified to try this on my own, as I am not what one would call “gifted” in the kitchen…BUT!!! I DID IT!!!! AND IT IS AWESOME!!!!! Followed your recipe to a T and I am obsessed with my finished product! One question, do you know the nutrition facts and serving size for this recipe? That’s so awesome, Katie!!! Congrats on a job well done! I’m not sure about the nutrition facts for the yogurt. I would think they would be about the same as the milk used, of course, with the additional bacteria benefits. Can I use Greek yogurt as my starter? Hey Tessa, As long as the yogurt has the good bacteria cultures listed on the ingredients, then you may use it! The bacteria is the important part. Has anyone tried to make a double batch? I find I go through the 1/2 gallon/1 1/2 cup recipe quite quickly and i was wondering if it would still turn out if I used 1 gallon to 1 cup? I do this all the time — I use about 1 cup of saved yogurt from my previous batch for a gallon. What fat content should the milk be? My 3 sons are dairy free and gluten free, I have successfully used this recipe for close to a year now, using dairy free yoghurt starter and lactaid whole milk! Works wonderfully!! Thank you so much for sharing, it saves us a FORTUNE! Each of their organic lactose free yoghurts costs $2 each (on sale!) and with just the boys eating 1 a day we spend close to $100 a month on yoghurt! Madness. That’s so great, Rose!! I’m so glad this recipe has been helpful for you! I would like to try this. I have a crockpot that the “crock” comes out. Do I leave it in and then wrap the towels around it and stick in the fridge? Hey Sandra, You’ll want to leave the crock inside the base (heating element), and then wrap the towels around the entire crock-pot. This is hands down the easiest yogurt recipe I have ever made. My daughter helped, and now she is actually excited to eat homemade yogurt. Thank you so much. We will be doing this often and experimenting with different milks. I’m so happy I found your site. Thanks for the great instructions. That’s so great, Jennifer! Thank you for sharing! 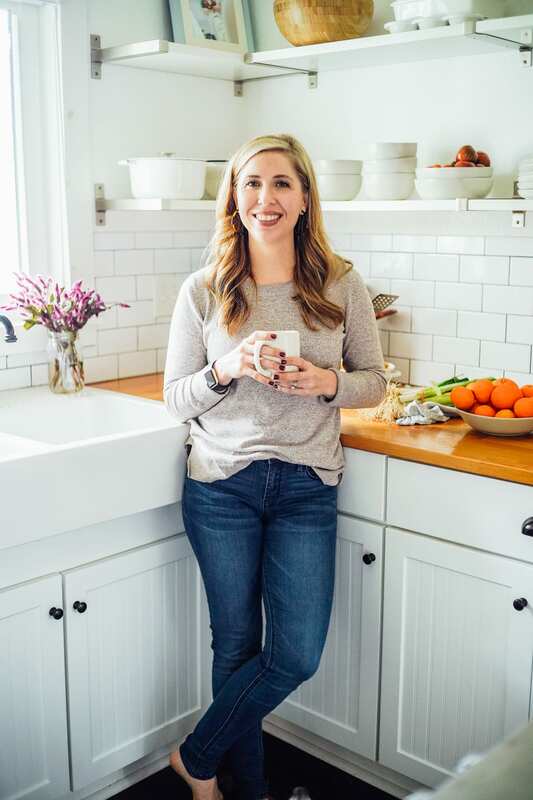 I started with this recipe 2 years ago — – I wrapped my crockpot in two large towels and put in the oven with the light on (this was in the winter and we keep our home very cool). But about 1 year ago I got an Instant Pot, with the yogurt function button. I use this recipe except now in the Instant Pot. I make it with a full gallon of whole milk. The secret to the best least runny, most “greek” type yogurt is to drain the whey. Yes you have to drain it and that’s MUCH more effective than chilling. You may not realise the difference between the greek style and regular yogurt is the amount of whey left in the yogurt. The greek is more expensive because it takes more milk to make it — since some of the volume is drained out. So I began draining. At first I had to drain in stages, using a super-cleaned white T-shirt (from a used torn-white t-shirt) inside a colander over a bowl, but I couldn’t fit all the yogurt inside. My local restaurant store to the rescue. I bought a square 6 quart cambro-type container and drilled about 16 holes in the bottom with a 3/8″ drill bit. Then put a square of the T-shirt material on the bottom, and nested the 6 quart container inside an 8-quart cambro I already had and put it out in my garage extra fridge (this is a tall contraption, I have to remove one half-shelf to get it to fit). After 24 hours in the fridge I have about 2.5 to 3 quarts of yogurt and about 1.5 quarts of whey. DO NOT put your whey (a yellow-ish colored liquid) down the drain. Save it for substituting for buttermilk in biscuits or cornbread or pancakes and for water in cake mixes — it keeps for about 3 weeks in the fridge. After that pour into your garden. Don’t waste that good stuff on the sewer or septic system! Awesome, Heather! Thank you for sharing! This will be my third batch like this. I love this recipe!! Unfortunately the 12 hour mark to put it in the fridge was 2 am and I slept past it to 6 am. I quickly put it in the fridge. Any chance it spoiled or get ruined? Hey Jennie, It will probably just be a bit more sour (cultured) than usual. Other than that, I think it should be safe :). I’m so glad you’re enjoying the yogurt and recipe. You could probably add some honey to it, or maple syrup, or cane sugar. That should help balance out a bit of the sourness. Does it matter what I use as my yogurt starter? Greek vanilla yogurt ok? Or does it need to be unflavored and non-Greek? Hey Jennie, Preferably unflavored yogurt (Greek or traditional) that lists cultures on the ingredient list. I made my batch this weeks with 2%milk as I have been doing. I got the timing right on getting it into the fridge and all. This time it seems a little grainier. Like bumps and dots in the yogurt as my son complained. any thoughts? Should I start over with a new fresh yogurt starter for the next round or should the little bit be fine? Just wondering. Don’t want to waste a gallon of milk. Hmmm, I’m not sure. I think the yogurt should be fine for a starter, but I’d also hate for it to add a gritty texture to the next batch. I’ll try it and see. It’ll be an experiment. And I’ll let you know. That way you can have it in your knowledge bank for your blog on homemade yogurt or if someone asks one day. Perfect. Thank you, Jennie, for being willing to test this. Turned out great! Much creamier! Yay, Jennie! Thank you so much for reporting back! I think I know what’s happening. My crockpot gets so hot that when I go to put the starter and cup of milk in whisk, I’m getting some curdling effect. Now that i take so long to heat the milk. That might be causing the bumps. Would you recommend doing anything differently? Hmmm, Jennie. Some crock-pots just run out. Could you start out on a lower temperature? Unfortunately all the controls I have is “high” and “low” in the crockpot. Would it help to turn it off once the milk has warmed to 180 degrees? while I’m waiting for milk to cool in ice bath. Hey Jennie, Yes, I would try that! Reporting back. Turned my crockpot off when I gave warmed milk an ice bath. Crockpot still very very warm but not burning hot and when I added cup of milk and starter it mixed well and didn’t curdle. Overall much smoother texture. At the very bottom as I emptied yogurt out today there was a little layer that was chalky tasting bit still really good! Thanks much! Hi Kristin, I just got my Instant Pot. I’m excited about it! It has a yogurt button/maker which is one of the reasons why I bought it….have you experimented with making yogurt in your Instant Pot? Would I do some of the same steps of this crockpot one? Thanks for any input! Hey Cassandra, Awesome, I think you’ll love the IP. I haven’t tried making yogurt in the Instant Pot. I think it’s probably similar to the slow cooker method. Let me know how it goes. I may do some experimenting myself here soon. Yes let us know! I think we’re getting one for Christmas so I’d love any tips! Has anyone done anything with their IP and yogurt making? I made this today as I am Lactose Intolerant and live in a small south Texas town that does not have lactose free anything except milk. It is perfect. I let it sit 12 full hours, as I wanted to start at the higher end and go from there, I am so thrilled with how it turned out. I just read some of the notes about heating it slowly so I lucked out as I didn’t really do that. I did use a really heavy dutch oven so maybe that saved me. Thanks again! Can I use some of this batch for my next batch. If so, how long do you think I can wait to make it again? Hey Jeanne, I’m so glad it turned out for you! Since yogurt is cultured, it will last longer than milk. So about a month? And you can use some of the yogurt for your next batch. I’m using your method and it’s working great! I found that by holding the temperature at 180-185 degrees for about 10-15 minutes when heating the milk, and simmering off some of the liquid, my raw milk set just fine in 8 hours. I used Maple Hill Creamery plain Greek yogurt for a starter. Can you use nonfat plain yogurt? Does that make a difference compared to whole milk yogurt or is it just the active cultures that are important? Hey Jennie, You could definitely try. The most important is the live active cultures. Let me know how it goes! Does it matter if you use a flavored starter yogurt? Will that make it taste weird or would you even notice? Anyone try this? Hey Jennie, I’m not sure. My guess is that the added sugar and flavors may produce an interesting taste. Have you ever heard of a way to freeze homemade yogurt? Hey Jennie, I freeze yogurt for the kids in small molds during the summer. Maybe try freezing yogurt in larger molds (mine are small, like ice cube trays). Ok so you’d do it in molds not a big container of it to freeze? Does it unfreeze in the same consistency as when it’s fresh? You could try a big container. Just leave room for some expansion. I’m not sure about the consistency since the kids usually eat them frozen. Thanks for sharing this! I made yogurt a couple of days ago and it went really well! I tasted the yogurt after 8 hours and it still tested like warm milk to me and the cockpit felt cool by then. Our house is at 63 degrees in winter sho I thought that might make a difference. I turned the oven on for a minute out two and then if then moved the crockpot there for another couple hours. The taste was what I wanted after 10 hours. Our family has upped out yogurt eating game since the baby has started enjoying it so we go through 2 jugs from the store pretty quick! Now I’ll just make a yogurt batch when we get near the end of the first jug. Thanks again!